GlobalTowne is the retail division of Global Pro Tankless Supply, Inc. This web site is focused on the needs of home owners. If you are a contractor or installer looking to purchase any of the products listed on this web site, please visit our professional web site at ProWaterHeaterSupply.com. GlobalTowne.com is the only Exclusive Bosch Online Retailer. Our expert sales staff is trained on the complete line up of Bosch Tankless Water Heaters. We know them inside and out. 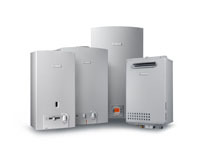 We can also help you compare Bosch heaters to those of the other major manufacturers. We also carry the HP 200-1 Bosch Compress Heat Pump! Global Towne is also a Z-Flex Authorized Distributor. We carry the largest stock of Z-Flex Z-Vent 3" and 4" stainless steel vent pipe in the country. We are also able to ship Z-flex 5" to 24" single-wall or double-wall stainless steel vent pipe. GlobalTowne is the EXCLUSIVE online seller of Sentinel Hydrosolutions Leak Defense Systems. The whole-house leak detection and leak prevention systems are the industry leader and a must-have product for high-end homes. We are also the EXCLUSIVE online dealer for the Virgo Water Filtration and Conditioning Systems. The Virgo Crystal system provides ten years of maintenance-free high quality water at an affordable price. See www.virgowatersystems.com for more details. Other products we carry include Webstone and Cimberio isolation valve kits, Danfoss electric floor heating, Precison Temp tankless water heaters for RVs and boats, Hydroblend filters, JC Whitlam descaling kits and solution, OnSite Pro leak detection systems and NyOil lubricants. GlobalTowne is located in Beachwood Ohio and that is where our main warehouse is located. We maintain additional warehouses in Wilmington Delaware, Memphis Tennessee, and Las Vegas Nevada. We can deliver most of our products to locations in the Continental United States within two days via UPS Ground Shipping. We ship daily to all Canadian Provinces and we have proven many times that our pricing is lower than pricing that can be found in Canada (even including duty charges). The sales staff at GlobalTowne.com is extremely knowledgable in the product lines we carry. We look forward to helping you select the best product for your needs.